A few of the French doors we have installed. This is a great way to replace a sliding glass patio door. Shown here is a 8' french door, two 30" 10 lite french doors and two 12" opening sidelites. The sidelites have screens on the exterior; this is a very convenient and a attractive way to get ventilation with out a screen door over the french doors. Sliding French Doors: Sliding french doors have advantages, you can put furniture fairly close to them and not have to worry about the doors swinging into it. 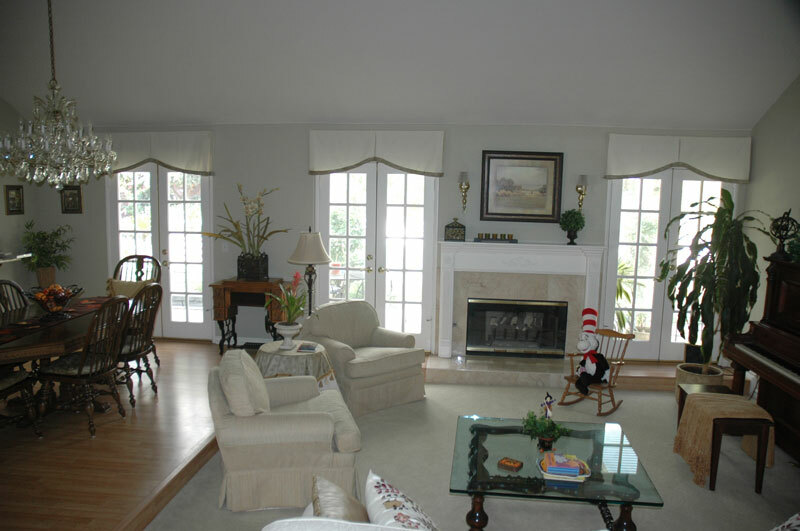 10ft, 4-door 15 light French Doors: Interior french doors are a very popular way to divide rooms. These are fir french doors to give a warm casual look. We also have mahogany and oak french doors that are very popular. This is a vinyl french door with vinyl windows interlarded into the system. Every thing matches and will last for decades. 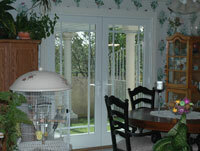 Using Vinyl Swinging french doors allows us to use the same girds as the windows. The best thing about Aluminum Sliding Glass doors is that they are easy to replace with something nice. When this couple wanted to fix up their home for their wedding they called DP Door. We prehung the French Doors at our shop, the actual installation took less then a day with no mess; nothing to touch up or clean up. The top of the line french doors. 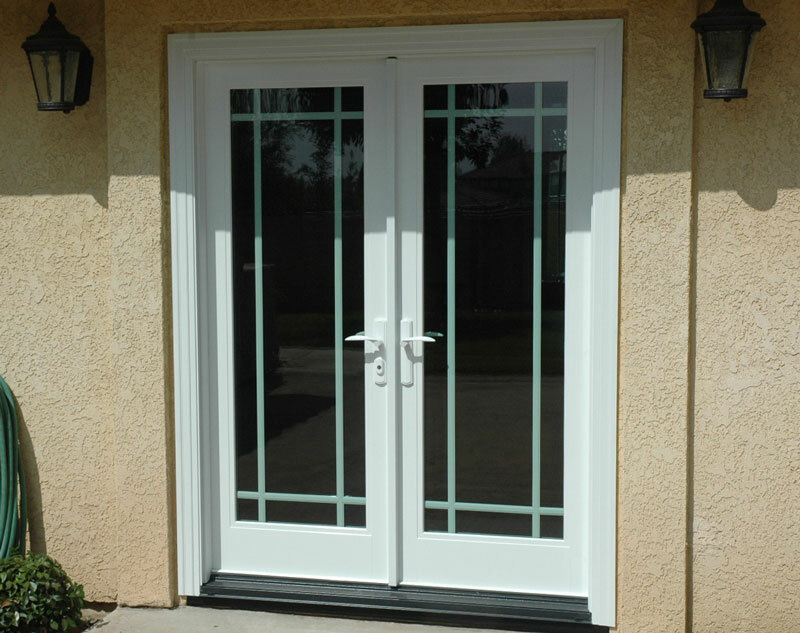 Milgard's fiberglass doors shown here with white interior. Also available with vertical grain fir or pine. Exterior of home with Milgard's fiberglass doors. This house had 6 sets if wood french doors that were hard to maintain. 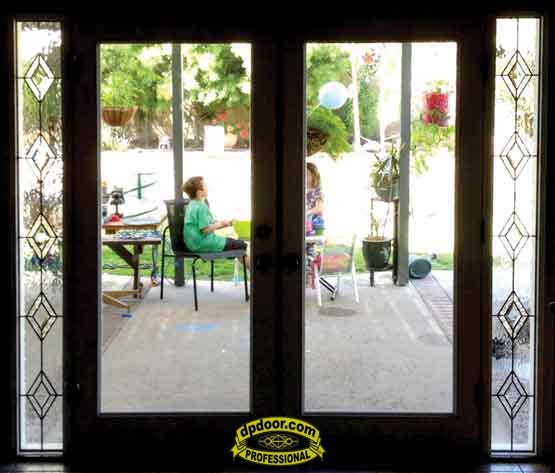 The Milgard doors have a full lifetime warranty and need no maintenance. Milgard vinyl dual pane (double glazed) sliding glass door with an arched transom above. This door has a french rail giving it the look of a wood french door. 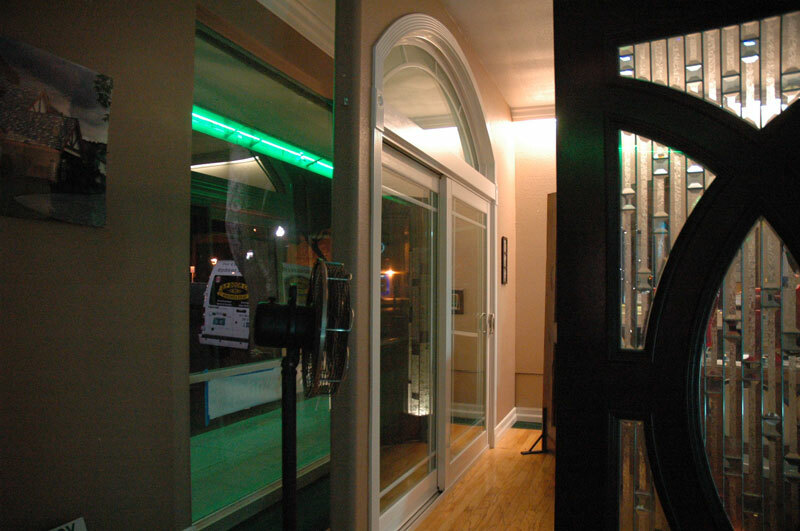 The doors are shown here in our Claremont office. Wood French Doors with valances. We install our doors with decorative moldings so no treatments are necessary but on some homes they do look good. We built this around the side light glass. 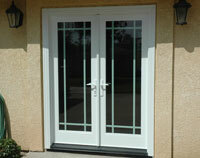 This is a Fiberglass 8 foot french door system with leaded glass sidelites. This was custom made by our head carpenter for a customer in La Vern. She had a wood french door system that was falling apart but she had very nice custom leaded glass that she wanted to keep. We saved the custom side light glass and made this fiberglass french door system for her. See our photo album of doors and windows?